In her last speech as the party president, she exuded confidence that Rahul Gandhi would lead the party with courage, patience and devotion, as he endured many personal attacks which made him "fearless". She also voiced concerns over the alleged attacks on the core constitutional and fundamental values of the country by the BJP and asked partymen not to relent in the fight against such forces. "We are all witness to daily attacks on our fundamental values, against freedom of speech and expression, against our rich diverse culture, and an atmosphere of fear and suspicion is being created. "Amid this, the Congress must look within and introspect and forge ahead. If we do not stand by our principles, we will not be able to wage this fight for the common people. This is a moral battle and to achieve success, we must set our house in order and be ready for any kind of sacrifice," she said. Sonia Gandhi said the country was facing "unprecedented challenges", but stressed that the party was not going to be scared and would fight it out. In her emotionally-charged speech, she recalled the times when she entered politics after losing her anchor (husband Rajiv Gandhi) and mother (Indira Gandhi), and how with the support of crores of Congress workers she steered the party to power both at the Centre and in many states. She said since 2014, the Congress has been playing the role of an opposition, saying "never before have we faced the challenge that we face today". "The fundamentals of our Constitution are under attack. Our party has lost several state elections. But an exemplary energy fires our Congress workers. We are not the ones to bend in fear, because our struggle is a fight for the very soul of this nation. We will never retreat from this fight," she said. She said party leaders and workers today are custodians of ideals and principles on which the nation was built. "This is no small matter. It is not power, wealth or self-importance that is our aim, it is this country -- it is safeguarding our fundamental principles," she said. Congratulating Rahul Gandhi on his elevation, she said personal attacks on him have made him fearless and voiced confidence his leadership would infuse new vigour in the party. "I am confident that with a new and young leadership, our party will be reinvigorated and bring about changes we need. You have chosen Rahul as your leader. He is my son, and it is not right for me to praise him. "But I will say Â– from his very childhood he has borne the experience of violence, the savage personal attacks he has confronted since entering politics has served to make him a brave and fearless man. I am proud of his endurance and firmness, and am confident he will lead the party with a pure heart, courage, patience and devotion," she said. Soon after a formal certificate was handed over to Rahul Gandhi on becoming the Congress president, she hoped he would lead the party with courage and dedication. She said she was proud of her son's endurance and determination. At one point when Rahul rose to speak, he sought his mother's blessings and kissed her on the forehead. 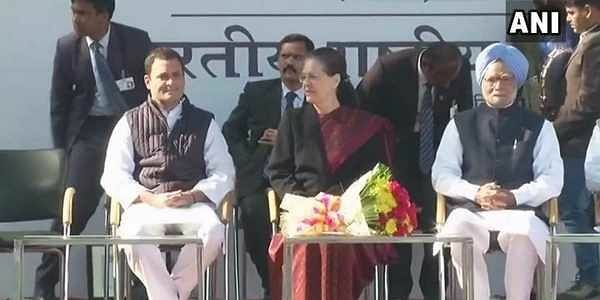 Sonia Gandhi, who headed the 132-year-old Congress for the last 19 years, also thanked party leaders and workers for the support she had received during her tenure as its chief. During the speech, she also talked about the time when she was reluctant to join politics following the assassination of her mother-in-law Indira Gandhi and husband Rajiv Gandhi, but said she had to step in after a call from partymen as communal forces were gaining strength. "I thought that if I did not join politics, Indira ji and my husband would have felt bad and their sacrifice would go waste," she said. As she relinquished charge of the party's top post, she admitted that when she took over the responsibility, "I was so nervous and my hands were trembling". Sonia Gandhi had to briefly stop her speech due to disturbance from bursting of firecrackers outside the AICC headquarters by party workers to celebrate Rahul Gandhi's ascension. There were at least three interruptions and she had to stop due to the sound of crackers. The event was attended by Rahul Gandhi's sister Priyanka Gandhi-Vadra, her husband Robert Vadra, former prime minister Manmohan Singh and other top party leaders. However, many senior party leaders were unable to enter the AICC office and had to return as a huge crowd of party workers thronged the building.